For customized frequencies, please specify the frequencies in purchase order. 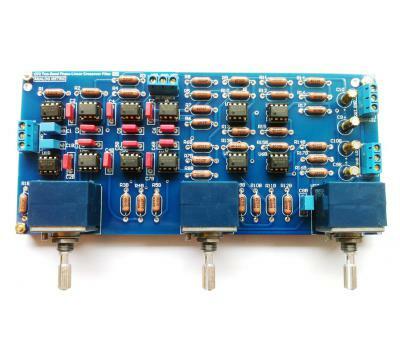 l Support two-band (low and high frequency) linear-phase crossover filter for stereo channel. 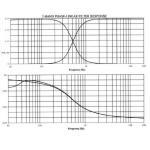 Frequency crossover frequency can be set by different resistor sets shown in the Table I.
l Attenuation 80dB/decade or 24dB/octave, linear phase. 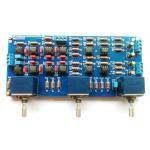 l Either use of very low distortion high quality audio OPAMP AD797, 0.03% at f=1k Hz typical or low noise OPAMP NE5534. l Three APLS / STD 50K POTs are used for the volume control: gain, low and high pass, for 0dB to -100dB attenuation. l Implement with non-inductance 1% Dale resistors, WIMA / RIFA / EVOX film capacitors, and Nichicon FW capacitors. l Symmetric PCB design for both R and L channels. l High quality PCB, blue solder mask, double layer, 2.4mm thickness, 2oz copper. PCB dimension: 188(L) x 85(W) mm. l For professional bi-amp, it requires exactly the same response time for the low and high frequency components. l Audiophile low-pass and high pass filters.